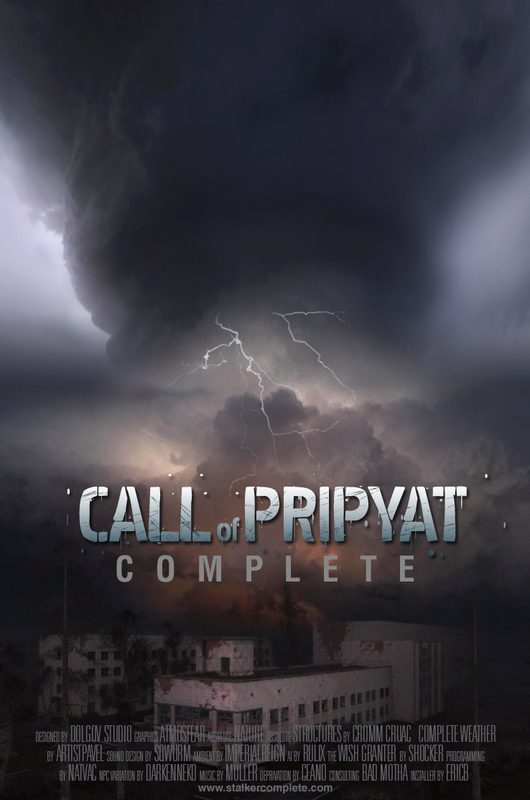 Call of Pripyat Complete is the third entry in the Complete mod series, which is a set of modifications created by professional artists dedicated to enhancing the production quality of the S.T.A.L.K.E.R. game series. The Complete mods emphasize on improving the original graphics, sound, and atmosphere of each game while preserving the core game elements. Built upon the success of Stalker Complete 2009, which was downloaded by one in every five S.T.A.L.K.E.R. Shadow of Chernobyl players, this entry in the Complete mod series is the cumulative culmination of the series’ achievements in aesthetically updating the game without introducing unnecessary or gameplay-redefining features. Designed to meet the desires of new players and veterans alike, Call of Pripyat Complete unleashes the full potential of the latest, most climactic chapter in the S.T.A.L.K.E.R and the Complete mod series. Weapon Selection - NPCs are now able to determine the best weapon for the situation based on the number of rounds they have left for their weapon and distance to target, switching appropriately. Using Add-Ons - NPCs are able mount add-ons, such as scopes, silencers, and grenade launchers, and use them accordingly. Armoring Allies – NPCs can now be equipped with player-selected weapons by either dropping them by or selling to them to NPCs. To ensure NPCs continue using their new weapons be sure to also sell or drop by them ammunition for the weapon, which then acts as an infinite ammunition supply. Friendly Fire - NPCs avoid friendly fire, and they will even stop firing and switch positions if their allies get caught in it. Melee - NPCs use melee attacks with rifle butts and knifes when the opposition gets close enough. Self-Healing - NPCs are able to heal themselves by using Medkits if hurt badly and apply bandages when bleeding. Reloading - NPCs are able to reload their weapons when needed. Stealth - Actor footsteps, knife use, silenced weapons, and the sounds of fallen bodies won't alert nearby enemies unless they are observed. Unreachable Stashes Fix - Makes the unreachable stashes (such as items that are wedged or stuck in environmental geometry) accessible. Jupiter Scanners Fix - Fixes the bug where the player could place the initial three anomaly scanners into the two additional anomaly fields that scanners aren’t supposed to be put in until later, which caused errors in the mission’s completion. X8 Burers Fix - Fixes a bug in scripting that gives the three Burers in the X8 secret room extremely large health regeneration (which made them virtually invincible). One Shot Fix - Fixes a potential game lockup during the One Shot mission cutscene. Helmet Fix - The actor’s helmet in third person view now matches the one equipped. Crow Fix – Fixed excessive crow spawning, eliminating the masses of crows that would occur after repeated quickloading. PKM Ironsight Fix - Enables the use of ironsights on PKM machine gun. Berill-5M Fix - Allows Berill-5M armored suite to be upgraded. Bodies Cleaner - Removes creature bodies at certain time intervals, reducing their unnecessary presence in the environment and improving the game engine’s performance. Since the game was made by a foreign studio, quite a few language related errors in dialogue, translation, and text in the English localization exist. As with the first game in the S.T.A.L.K.E.R. series, misspelled words, typos, grammatical errors, and humor lost in translation can be charming at times given the context, but create unnecessary difficulty in understanding their meaning. Numerous typos and grammatical mistakes have been corrected, and most of the conversation text has been changed to make more sense and read better to English speaking players. Some parts of the user interface have also been changed to be more internally consistent, and as a bonus the subtitle timing during the intro and outro sequences has been altered to sync with the audio. We are proud to introduce the work by a special guest, internationally acclaimed sound designer and composer Michael "sQwurm" Tornabene, known for his work for games, films, TV, and media exhibitions around the world. His contributions include new sounds for creatures, anomalies, doors, a reworked footstep sound system, and more. Improvements to ambient sounds are done in Imperialreign’s Ambient Audio Overhaul, and each map now includes a sound theme that varies between night and day. Also, all weapon sounds have been replaced with comprehensive analogues. All of the new sounds have been integrated into the game without removing the original sounds unique to the game, ensuring a superior audio experience aligned with the Complete mod’s vision. Call of Pripyat Complete introduces over a hundred acoustic guitar and vocal songs, with 23 new compositions added. New guitar tracks have been added to the existing campfire music sets. This live music was recorded specifically for this game, creating an unforgettable ambience. Putting the fate of NPCs unfortunately caught in an emission wave in the player’s hands, you can decide if they will turn into zombies to satisfy all your zombie killing pleasure! This feature is brought to you by AtmosFear, and is selected during the installation. Players can choose whether NPCs will be killed upon contact of the advancing emission wave, at its end (as in the base game), explode, or turned into zombies. Real Weapon Names - All in game weapons now are labeled after their real life counterparts. NPC Variation - Adds new NPC models and skins in the gameworld, increasing the variety. The Wish Granter - Activated via the ESC+F1 keyboard shortcut, a hidden interface designed to let you spawn items, place anomalies, characters, mutants and much more on the map is at the player’s fingertips. You can essentially build the game around your preferences through this interface (this feature can be toggled on and off, see User Manual for details). Sleeping Bag - S.T.A.L.K.E.R. Call of Pripyat features a newer native sleeping mechanic. The fans of the traditional Complete series’ sleeping bag won't find it in the actor's inventory, but will be able to purchase it from traders, and in rare cases, find it on NPCs. Loot Money - Players will be able to randomly collect small amounts of money from dead NPCs. The collection will be indicated with a coin sound effect and the amount will be shown by an on-screen alert. Absolute Scopes - Improves the scope system to be similar to those used in most modern FPS games. Breakable Bulbs - Lights can now break by being shot or by nearby explosions, changing the ambient environment. Elite Nightvision - Improves the green and black & white night vision. Teleport - Allows the player to jump between points in the environment with the ability to save custom location coordinates for future use. works like a “smart quick-save”, creating a separate save file with level name, in-game date, and timestamp each time it’s used. Normal - A well balanced combination of graphical features designed to stay within the original game's system requirements. This version is recommended for most systems to ensure a trouble-free gaming experience, especially if using 32-bit Windows, a laptop, or only moderate hardware. Advanced - Offering a greater variety in weather conditions and NPC appearances, this version is designed to take full advantage of high performance 64-bit systems with 4GB or more of system memory and at least 1GB of GPU memory. Select this version if you have an enthusiast-level system and are comfortable with significantly increasing the system resource demand. You may change which mod version you have at any time through uninstalling & then reinstalling the mod. However, while the Normal version saves are compatible with the Advanced version, the Advanced version saves are not compatible with the Normal version. Please refer to CoP Complete thread on [GSC Forums] for support. The User Manual contains a comprehensive credit list with references to all authors involved in the project. Huge thanks to everybody in the Stalker modding community. Yayyyyy, this is splendid news! I'm almost done with the vanilla version, so I will truly get to appreciate the work put into this. Awesome! I just finished SoC with Complete 2009 and I can't wait for this! Still working on the vanilla game and it's a well-polished game indeed- all that needed removing was the headbob and the FOV. Now all I need is a decent vidoe card so I can max this baby out when it arrives. I can't wait til you release this, although Call of Pripyat is great vanilla.. The only thing that really bugs me is the amount of bleeding that shows when you shoot something. It's almost cartoonish. Any way to lessen the blood? Hah, that's the way isn't it? I've just finished Call of Pripyat again last night - this time with my new GTX285 OC. With settings at max the game cranks. I'll see what modifications the COP MOD makes and toss up whether or not to replay again at some stage. I have Clear Sky Complete 1.1.1. and was just about to start replaying. What does 1.1.2 add and is there a patch to take me to it or do I need to download the new updated MOD file? Really well done on the MODS. Fantastic work. Excellent news - the vanilla game is absolutely horrible, runs bad and looks even worse. HOo-RAay!!! That's what I was hoping for when I surfed here! I absolutely loved SoC Complete 2009. If you could include these in your upcoming mod, I and many others would be very grateful! any update? when will this be out? Hey guys, this going to take a few months, I'm cooperating with a number of modders and the results should be great, check back by the end of the summer for first updates. It really amazes me, the depth of peoples ignorance for GRAMMAR and SPELLING. Other than that, Artistpavel, your modifications of the Stalker games are absolutely second to none. Thanks for working on this, your mods are brilliant. I have a special request for CoP Complete: please put more mutants and more random firefights into the game. The original CoP was very unbalanced in this sense, as I often found myself running around for miles without firing a shot. The freeplay after the ending was also useless in the original version, as there was really nothing much to do after the choppers took off. My major request right now is better weapon sounds in CoP. They sound very muffled, and apparently this a common complaint. Anyone have a suggestion for the best sound pack to fix this? The faction war is possible, I dont know how to do it but it has been done in other stalkers before. For the faction war you just need to set up base camps and turn on or off the a-life and the rest does itself, I think though add the ability to actually join a faction too would be nice. This is gonna be so legit~ . I just got bought Call of Pripyat on Steam instead of Resident Evil 5 for $12.50 just to experience the Complete mod. There is a Achievement in Call of Pripyat that is called "Marked by the Zone" and you need to survive 3 times an emission without taking cover (you need to take the new anabiotics drugs to survive from them) to earn the achievement. Pavel, would you be willing to share with us how much more money you need to finish this mod, so people like me can more accurately donate to get you funded. Its one think to just throw a couple dollars here and there to you, but if we had a ball park it would be easier for us to set a goal. Will I be able to use high resolution textures with my 32-bit OS? This ruined Call of Pripyat for me, visually speaking of course. I dont really mind im familiar with the other complete mods however I was thinking, like it should kick in after free play, because free play was kind of borign after a while with nothing to do. So I thought making these factions all sorta pop up once the other stalkers enter pripyat it would make sense. Thank you forever for all the brilliant work. Just installed CoP but cannot be bothered to play it before you guys release your complete. Currently playing CS Complete and loving it and after installing CoP and trying it out it felt so bland compared to your work. Pripyat will have to wait until you're done. you can probably add in the bases by just locking at the places which already there and there are a lot of sutebel places to tern in to bases as well as that the which granter thing from the cs mod was excellent and hopefully it will be brought to the cop as well but the idea of a faction war would be epic/asum. i hope you pic up on some of these request and even if these are not sum thing that occurs in the mod i know it's gonna be superb just lick all your other mod's. PS grate work on the cs mod. Any ETA for Beta release? Just finished the game today and would love to play it again with the Complete mod. i played through SoC and CS, both with and without the Complete mods, the mod was FANTASTIC, the CoP S.M.R.T.E.R. mod on filefront just doesn't do it for me like these did...any news on a release date? Thanks for making the games I love into something playable and enjoyable. I, and many others, greatly appreciate the work you do on The S.T.A.L.K.E.R. games to make them as good as they can be. CoP: Installed, ready and waiting! I loved Complete 2009 for SoC!!! I cannot wait! I recently bought SoC and CoP off steam and your mod made SoC so much better, that I will probably buy Clear Sky and get complete and play that to kill time until CoP complete. Keep up the awesome work! nice, hope you fix the crappy lack of toggle crouch, and that horrid Night vision, man did I feel ripped of the first time I used that. Pavel, could we get some news on the progress please? I'm just getting angry playing through CSC 1.1.2 with all the bugs still crawling around while waiting for CoPC. Agree, there´s a bunch of us out there who refuse to first play the game without your mod. The waiting is killing us!! Could you please tell us, at least, if it´ll be out before Christmas? No way, CoP Complete?! I finally bought and installed the game for the first time and never imagined you'd have CoP Complete out! It's me, LadyO! I'm super excited. :) Haven't played any Stalker games at all since way back. I will try to make it over. Am playing Vanilla for awhile, but textures are a different matter. I remember that once I installed your mod, I was never able to stand to play Vanilla again. glad to have you back, you were one of the first people to see this little known mod emerge and your views and countless contribution helped me shape it to what it is today, now as you can see there's a whole series of Stalker Complete mods! I'm aiming to bring the CoP Complete before the end of this year, I realize a lot of people count on it. Thank you guys for support. Thanks to you for your work, Pavel. I´m subscribed to this feed just to check out your updates! I realize you probably have limited time, but if you could have the mod ready for Christmas, you´d be giving us some cheerful holidays FTMW. I have recently purchased Call of Pripyat but I don't dare playing it without your mod (afraid of being disappointed) so it will remain in the box until Pripyat Complete mod is released eventually ! Keep up the good work Pavel, I'm looking forward to CoP complete. The day you release it, is the day I'm going to buy a Direct X11 capable card so that I can enjoy CoP in all its glory with the complete mod. I hope I'm not repeating someone asking this already, but I'm sure lots of people are wondering if Complete will have any kind of compatibility with Arsenal stuff. And just as these other fine folks have, I want to thank you for all the hard work you put into making this series beautiful. I'm excited to experience the wonderful COP Zone in Pavelvision! Pavel.. have you looked into creating a kickstarter.com project? As you can see lots of people are eager to help you out - me included - and kickstarter.com could be an enhanced alternative for greater success in your projects.. Thank you very much for your dedication. Take care and keep up your EXCELLENT work! I'm embarrassed to say that I just heard about your mods a few days ago. I bought both SOC and COP on Steam a while back, never got into them, but I downloaded your Stalker Complete 2009 mod yesterday and I was blown away by all the work and sweat that was put into it. Awesome. Keep up the good work and I look forward to seeing COP complete, hopefully before the year's end :) Cheers mate. I know, Pavel. I never imagined that SC would have taken off the way it has, simply because it had gone into a sort of lull for awhile shortly after I stopped playing for awhile. I'm really impressed, but not too surprised since I know you're a super talented guy. It's so cool to have watched it evolve! I look forward to Pripyat Complete! I haven't even tried the second one, so I will try it out while I wait. Merry Christmas if that is what you are into. I am looking forward to the new complete to be completed soon. You truly are an artist of the highest calibre. Excellent job of the first two mods! I steer everyone I can to your mods to make their games "complete"! Can't wait for the final mod!!!!! I'm looking forward to this. I picked up CoP on Steam the other day but holding off on playing until Complete is, well, complete. Holler. I've played through STALKER Complete 2009 and just finished Clear Sky Complete (literally, just now! ), so I'm pumped for the launch of CoPC. Hope it's coming together, fingers-crossed we'll see a release in the next month or two - I'm not playing CoP without it, no matter how good people say it is! The world is waiting for Mr. Pavel to finish CoP! Mr. Pavel, the world is on the line, what should I tell them? - I'm busy!!! wait and leave me alone. But, Mr. Pavel, they deserve an update. How about a screenshot? I don't think that would be a good idea, sir. Perhaps a new sound demo? the bunker door wasn't very impressive, it felt unrelated to anything else. - Tell them I'm in the toilet and take a number. Thanks for the hard work. Eagerly waiting. Can't wait! I only liked the stalker games before SoCC and CSC, now I love them! Thx for your work on the previous Stalker Complete mods! I really appreciate your work! I have played SoC and CS with the Complete mods and it was just amazing! But now, with CoP on my hard drive, I really want to know when CoP Complete will be released? Is there an estimated release date (approximately)? This would be an awesome Valentine's Day present. OMG thsi is taking forever it went from 80% to 90% in like 6 days 90% to 100% is taking forever!!!! ...and laughter was heard all across the globe as women, children and old men joined each other in dances and celebrations, for Pripyat was Complete! "The mod is being tested and prepared for release. This will be the best Complete mod to date." my girlfriend asked me why I was crying out a "OOOOOOHHHHHHHHHHH YEEEEEEEAAAAAAAAAAHHHHHH" while reading these good news ! So glad your doing one for Pripyat. I can't stand the way the game is vanilla anymore. If he puts up the download link in order for everyone to "test it for release"...that'd constitute a "release" wouldn't it, folks? I have been impressed with the previous mods. Will this one work on the steam versions? Yes, AP's mods work on Steam versions without issues. I can´t wait!!! It´s a excelent job!!! Congratulations!!! I've been waiting a year to play PoP with this! Kidding. Mostly. Above all...thank you. AHHHH i've been checking every day for a few weeks now, im peeing myself in excitement. I love you artistpavel!!! Wonderful trailer Pavel, I can't wait to get my hands on the complete mod. ...damn, it will take months to wipe MrPavel-driving-his-car 's picture out of my mind. And GSC Game World hasn't hired you Pavel why? so is it done? I dont see the "coming soon" or "being tested" anymore.... link to the DL page? so very excited to re-play CoP with the Mod installed. could be being uploaded rodger? When it's done, in addition to the feature list/summary, can you please post side by side comparisons of before and after? It would be really interesting to showcase the improvements and hard work in a practical "true to life" way, and convince everyone to download the mod. Stefan, hopefully next week. ? I will be donating a grand total of $5 us dollars upon successful shipping of this mod as thanks for your work. dont spend it all at once. Can't wait till release! You and the people who've helped really are awesome pavel. I really appreciate all the hard work you've put into this mod and i'm looking forward to playing it. When can we download this, then? Man, this is nuts! I've never seen people so excited about a mod. Relax, dudes. The download link will get put up when it's ready. You've been waiting months for this already, a few more hours is nothing. Go read a book, go sit outside, go for a walk downtown. If you own a musical instrument get it out and practice it. We're sorry, but no downloads were found matching the criteria specified. We suggest you try the download list with no filter applied, to browse all available files. He's not teasing us. It'd probably a problem on moddb/filefront's end. Sooooooo good. Love the vanilla game but I was eagerly awaiting for your mod! Will donate, the breadth of this mod is just mind blowing. Tried your mod, crashes the game instantly upon starting a new game, its borked beyond relief. Renaming the gamedata folder/starting a vanilla game the renaming the gamedata folder back with fix it for maybe 10 seconds. Works for me but it seems to dark all the time ive played 5 game days and all are dark and im going bye mid day 12:00 to 13:00 it so dark im using my torch all the time is how its ment to be or a bug ? Matt, Pavel made the best mods for previous stalker games - "waste of time" cannot possibly be used to describe his work. Thank you very much! It's working perfect! I'm downloading it now hopefully it's more akin to Complete 2009 than Clear Sky Complete. Clear Sky Complete wasn't bad, but for that game at least it wasn't what I was looking for. When it comes to Shadow of Chernobyl though, your work is tops. Anyway, I was curious who did the music in the CoP Complete Official Trailer, and where you got the music for the Clear Sky Complete main menu> Thanks for your work btw. When I try to start a new game the screen just freezes. Its just me or there is something wrong with the artifacts? i see dots on detector but no artifacts on groud, in the trees and whanot. So far tried GTX260, GTX480 and 6870 .. all same result .. no atifacts. Ok I have a Russian retail version and the game crashes at start. Any ideas? Do I have to change something? When you start a new game you need to be patient and wait before it starts. It will take some time to get to the loading screen. Even if you wait sometimes is still doesn't work. I got it to load once and then I could never load a game again(I did start a new game and was trying to quickload) It would always crash (I mean crash, not freeze it would actually kick me back to desktop and give me the windows "application experiecned error" or whatnot). I heard on ModDB that it doesn't work well with DX11 or DX10, probably due to AtmosFear (Unless AtmosFear 2 fixed that. AtmosFear 1 only worked on DX9) I belive AtmosFear 2 itself (alone, independent of CoP Complete) has problems with higher DX settings, but I'll have to test this. That aside the short time it did work looked great. The only thing that slapped me in the face was the greatly enhanced view distance and the beautiful panoramic view in the distance. Definitely a large improvement to the environment alone. Just a theory, but is it possible ModDB doesn't have the file now because Pavel's aware of these problems? Anyway I'd advise waiting. Pavel do you not get that your download link isn't working? At least update it to match the one that Zach posted in a comment. Sorted my darkness issue bye deleating my user file in the save file and deleating the graphics cache file ,all works well and im geting into this .thank you. The patch says it can't find Call of Pripyat on my PC. I have the Steam version of it. Any ide ahow to fix that? My same problem is the problem Cory has. Does anyone have a fix? I'm having issues too, I can get CoP to run once per session. That is, when I start the PC (Steam version of CoP is what I have) I can run CoP. After I quit out, I can't get it to run again. X-ray starts up and is in processes using 7-8M of RAM, but that's it. I can't exit Steam without killing the X-ray process. Once I reboot I can run CoP again. But only once. If I quit out the problem returns. Can't wait to see it once the bugs are worked out. Keep at it guys! X-Ray 1.6 Has Stopped Working ... I was able to play one time, everything totally maxed at 1920x1200, it was awesome. Then I died after the first helicopter examination, and I haven't been able to get the game running again. Tried deleting user.ltx and running on straight default settings, tried restarting PC, tried re-installing mod ... it now always either crashes w/above error,or hangs indefinitely, at the loading screen (Zone Tips Screen ... the bar fills all the way up, but the game won't actually start). Okay ... an update ... I can start a new game, and it works fine, just as before. But none of the saves I made from the 2 hours I played earlier today (this from a fresh start after installing the mod) will work. Another update: none of the saves I made from the 2 hours I played earlier today (this from a fresh start after installing the mod) will work EXCEPT for the first one, "arrival at the skadovsk". Everything from 'strange glow source found' on (about 7 manual saves + one autosave at helicopter) appears to be corrupted and just causes engine to stop running. I have 1gb radeon 5850, 4gb ram and its crashing. Nothing helps. my question: is it pissible to get the mod working under Dx10 or is it writen to use only Static Lighning, im waiting for an answer. The first two STALKER games were extremely buggy, even after the patches, and the gaming community fixed them. Pavel then added the cherry on top with his great COMPLETE mods. But COP was stable and very good looking from the beginning. In a total reversal, it is now the COMPLETE mod wich is extremely buggy. NEVER release a mod without enough testing to ensure stability on most systems. The comments here and at moddb are full of frustrated people, and I am one of them. Being someone who has a stable system that maxes out pretty much ALL games out there, and someone who hasn't encountered any problems in all the latest games, I have to say that having to set COP COMPLETE to low settings with static lighting to load the game when the vanilla version allows me 50+ frames with everything maxed out is just ridiculous. I'll be back in a couple of months. So long. CoP Complete works without problems for me in DX11 mode. HD5750 512MB, Windows 7 64bit. I've managed to solve my problem by renaming gamedata/config/text folder. I am only able to start a game when I disable Crossfire (2x HD5870). With CF enabled my memory runs full. The game loads until the full 4GB is full and then everything stops. With CF disabled only 3.2-3.5GB in total is used. Try reducing texture quality, disabling game prefetch, closing any other apps. Honestly, why would I reduce texture quality to run the mod? Textures are CoP's biggest weakness anyway. Besides this problem existed with some users in the base game (so it's not artistpavel's fault though his mod may make the problem more common) evidenced by the article he linked to (ATI Crossfire Users look here. )I don't have crossfire though. Reducing texture quality and disabling prefetch did indeed solve the problem. However, without prefetch and texture quality set to max the game stutters like hell. I'll wait for my new new mainboard and 8GB to arrive and see if I can then max out everything again with CF enabled. Can't standing anymore the wait for my dose of Complete ('was realy long, quite a year... :'D), I've started to play CoP again with the Absolute mods (Nature 2.1 and Structures 1), Atmosphere, and a few things like a "wish granter" (exist in french, wich is my case ;)). All this in the hope to match an approximation of Complete and have a XRay config wich will be compatible with the final mod. Then, the precious has finaly arrived. YumY ! Have to wait again to let the download appears ('was weird), and a few more hours to let those who have a standard CoP rush on the mod (yeah yeah, that's fair ;)). So, i've downloaded it today, looking forward for the end of the working day :D.
That's the moment of truth. - I delete the "gamedata" folder, and the "logs" and "shader_cache" from the documents folder (keeping "savedgames" folder and "user.ltx"). - Try to install the mod by the setup => "can't find Stalker folder"...(no, it's not in "program files", the setup diserves a path explorer ;)). And ? And ? And ? Loaded two different saved games succesfully. Saved and then left the game, relaunch CoP and loaded the last save, tested the basics of the game (move, jump, shoot, pda, etc.) without problem. i just have to deactivate/activate the crosshair, wich was invisible. As i said, my version was close, with a best level of graphics than the original... Close, but not equal to the final Complete.Really amazing. I mean really. I have just played a few minutes but forced to stand and watch the beautyful weather conditions. No matter if it rains, shines or whatever, it's just stunning. A Intel SSD for the system and a little RAID0 (cheap and not top but quite good) where STALKER games are (the 3, in Complete, of course ;)). I haven't changed my settings since my prior mod compilation wich is on "maximum", DX11, 1920x1080 (no "advanced" settings), and the catalist settings are by default too. The game seems highly playable with this settings, since i already have played a part of the game with those. Hope it will stay the case when i get closer to pripyat, but really seems ok. Exactly as AtmosFear+Nature+Structures, the game is increddibily long to load. In fact, even the simple launch of the game is longer than the game with no mods (strange isn't it ?). Then in the STALKER menu, a long minute to pass the select saved game screen when you start to load one. And another (wich seems even longer) to have the "click to play" message. A total of 3 minutes to get into the zone. But i say it again, that's quite like my basic compil, very (very) long. Maybe a little more, certainly from the audio part of the mod. Besides, in game if you play, save, (maybe die), load a save, or even when you cross from a zone to another, the loading time is not so long (a little more than a no mod game). @ those who experience problems (but no CtD): As said, try to clean up all your CoP files, including userdatas (in the "documents" folder) and do a fresh install of the game, then the mod. All settings to "defaults", game as graphic drivers. And to know if the machine has freezed or is just working, don't forget to watch the HDD activity LED ;). So now, i have to take this post to thanks you a lot, Mr Dolgov and all the community of modders, who gave me so much hours in playing the STALKERs trilogy, from so much time. It counts in years now and i'm happy to see there is always people to work on this game(s). I bend over you guys, i can say that. You did a great job. And you still. More specialy to you Pavel, I'm really glad to see your carrier take a way inspired by this part of your work and i wish you the best for the future. Keep up the good work, you rock ! Hope to see further news from you or your work. For me, the mod definitely seems to make bad save files after first going to Skadovsk. My ancient save files (from before using the mod) work perfectly, but not the ones made by the mod (after a fresh game start, btw). I get 'x-ray stopped working' errors when I try to load any of them. Quite a few angry folks on the web, I've updated the post to clarify the issue. This is /amazing/, thank you so much for making the game so much better. And people should not get angry. I tell you about the bugs as a friendly gester. 2) I have the game entirely maxed out at 1920x1200. 4) However additional new saves made after leaving Skadovsk won't load. The system stays on loading screen forever, if I ctrl-alt-del, the x-ray crashes. 5) If I delete the user.ltx, and leave everything at default settings (which is like 1024x768), x-ray will crash immediately before launching the game. RAM usage in TM shows about 2.2MB which is very high for a game, but I have 6GB on W7 64-bit system. It really seems as though something I did on Skadovsk (which was nothing unusual) caused my save file to be corrupted, and all subsequent saves as well. The "Complete" mod works perfectly on my system. Load times are fast, no longer than the vanilla game with all graphics options set to maximum. Thank you Mr. ArtistPavel for keeping the STALKER series exceptionally fun to play. Been looking forward to this like crazy, but I seem to get the same instant-crash-on-new-game problem others have. (Nvidia graphics card, so it must be the texture overload.) Looking forward (again) to a patch for this. In the description of the mod it says it has the Absolute Scopes addon but in reality it is the Gnomus Weapon scope mod. SVD, SVU and Vintorez use Absolute Scopes, the rest use Gnomus, I figured it was more fitting that way. I'd like to know: I've got a french version... will it work with it? Inital release crashed on start new game for me. Post optimization patch, new game will now begin. Have not played but have checked intial non-choppy movement, inventory etc. All settings maxed on DX11. It seems to work with the new patch although it is a bit choppy at times, but that doesn't matter. Thanks! Thank you so much Pavel. E8400, HD4890, Windows 7 64bits, 4GB ram. Patch fixed loading problem. Thank you. Do we miss out on allot of eye candy with this optimization? I would love to get into the CoP and Sky mods but I am still stuck at trying to get SoC working. The same old Xray issue crashing at the first load.. I spent two days searching the internet and installing and re-installing, even did a full re-install of the OS!!!! And no-one, not even the author has provided ANY explanation or fix..
After months of waiting, here's my little comment : YOUR MOD TS FUC¨¨ING AWESOME ! Gonna test and enjoy further now :-) thanks! Thanks for reports, optimization patch 2 is up. Got archive error "copc_1.0_optimization_patch_2.zip: The archive is either in unknown format or damaged" Downloaded several times with 2 different browsers. Stan, it was still uploading try now. For everyone still having problems, the mod will continue to get optimized in the next few days until we get it all sorted out. I wonder if you respond to my post re the 2009 mod? Do you have any tips so I can get it working? Or is it a hopeless case and I should juts drop it and move directly to CoP instead? Can anyone help out with some suggestions here? I am really keen to get into ArtistPavels Mods as the look so good, and all I have read (form folks that get it running) says it is awesome!! Well still can't get my save working. I've tried both patches, changed GFX settings, some voodoo and did a rain dance (don't ask why). Still nothing. I really don't want to have to start a new game played too long already. I guess I'll have to if nothing in the near future fixes this. Could you get back to me and let me know what the crash log on Moddb told you? Cheers. Can I paste patch v3 over v2? Yes, all versions can be applied on top of each other. Patch v3 running fine here on DX11 all maxed at 5040x1050, Pavel ive created a "fix" for the scopes at surround / eyefinity resolutions, posted here - http://www.widescreengamingforum.com/forum/viewtopic.php?f=61&t=22650 , hope its ok, fantastic mod btw, ill post some cool surround screenshots soon at widescreengamingforum.com, cheers. I tried all of the suggestions except rolling back my graphics driver, and tried the latest optimization patch to no avail. Playing on a laptop with: Intel Core 2 Duo @2.7 GHz, 6 gigs of RAM, and a slightly overclocked ATI Mobility Radeon HD 3670 with 512 MB ram. Was running beautifully. Thanks for your badass mod and your time, looking forward to SoC Complete 2012. All graphical settings maxxed except AA and AF which is zero. Textures at 80%. Spent 10 hours in the game. Game runs smoothly except for a few microstutters (1-2 seconds) when running around Zaton. Yet to venture to Jupiter though so might report back later. 1. Textures sliders could not be maxxed out. I could only set it at 80% value. Everytime I change the slider to 100% it will auto-revert back to 80%. Is this a DX9 problem? 2. I could loot money from bodies in Zaton over and over again, despite them having nothing in their bodies (I've already looted them the first time). Is this a bug? 3. Actor can die during emissions when he's hiding in Skadovsk. Yes I had my weapon out. Is there a way to survive emissions even when my weapon is out? Does Patch 3 contains further compression of graphical assets? I'm running it pretty fine on Patch 1 only, and I do not wish to use Patch 3 if it means compromising on graphical quality. 5. I'm using FOV Switcher by MacroN. Does using Patch 1 override my custom FOV settings? I'm using 75 degrees FOV instead of default FOV of 55. Thanks Pavel for a good job once again. 1. Not sure, but not because of mod. 2. This can be fixed but you can look at it as if you double checked their other pockets. 3. Probably the no weapon script. 4. You don't have to use the new textures, but I haven't noticed much of the quality loss after compression, saves a chunk of memory though. 5. Changing FOV is ok.
Hey there, fantastic mod, love most everything. But with my system it will only run for a bit before CTD. I've turned things down a fair bit, using enhanced lighting (non-dx10), textures at 40%, all other settings at medium. I installed the new fix (Mar 13) and it won't even run. :( CTD on start. I would have to make a Lite version for 32-bit users. Something's screwy with the patch #3. It says 60mb on this page, but the first time I tried to download it, the file was only 30mb. Now I tried for the second time and it was 40mb. Both times winrar complained about 'unexpected end of archive'. I fear the patches might be corrupted somehow. Ok, it's fixed now. File is intact and 60mb. Does any one know how to get immunity to emission? Because I want fast forward time/weather to see everything. I can see the artifact moving around and making a ripple in the water, however when I have my detector (bear) out, it doesn't beep or discover the artifact even if I stand on to of it. Damn. Thanks anyway. If you ever do work up a Lite version, I'd appreciate it greatly. Great work. 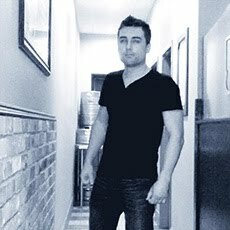 I'm a Toronto based freelance artist, designer, illustrator and actor. On this page I share my art, mods and free graphic packs. Download, like my page on Facebook for updates, don't forget to donate and enjoy your game, cheers! Thank you for continuing to support me as I keep brining you the content. If you find the downloads on this blog useful to you, please consider making a donation.